Like the others, I really like your plan for the trackage and scenery. Really will have the look of the Babcock operation. (Perhaps the little logging branch will come down from Landisburg! Seeing what you are doing in your new home is inspirational as we will be moving to Charleston SC sometime this summer and I will have the opportunity to design and build out a new shop and layout space. 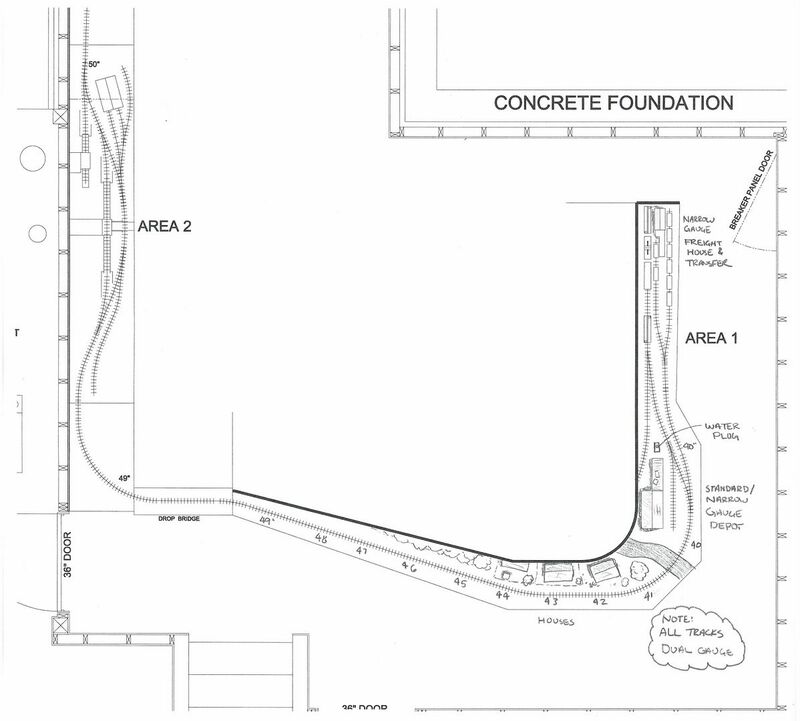 I like the plan and can see it being a complete layout with a staging traverser at the lower left end. Could have rod locos to work from the town up to the switch back branch and shays to climb the hills just for variety. Toss in a TT where the switch back connects to the "main line". 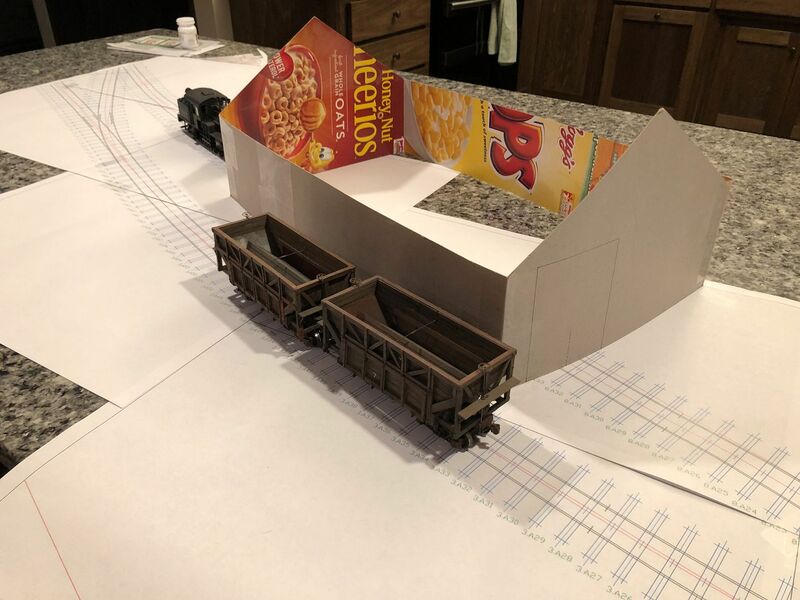 Definitely like the staged log train idea -- drew one into the Ron Hatch Fulton County NG plan off the open leg of the wye when I was going to build it as an On3 or On30 shelf layout. thanks for all the comments. My RR is a pretty simpler operation, mimicking the Manns Creek as much as possible, so a turntable would be a luxury those types of railroads would not even think of having, and it is that kink of thinking that I had to keep telling myself so I don't add too much. however, if you look at something long enough you'll find something you don't like or could do different. one area that has been worrying me is if I could pull off the separation of the inside of the layout and the outside without a backdrop divider. it would be great to not have the backdrop there to limit the depth of the scenes but I don't think scenically I will get that isolated feeling of going down in the gorge. I also don't think I could get the vertical scenery I was hoping to get as well without more horizontal separation in the tracks, there just does not seem to be enough space to go up and then back down, tall trees would help but rather then looking like a forest I think it will look like a row of trees. I started playing with the idea of "what if" I have to add a backdrop down the middle, and how would I get from one side to the other without going through a hole in the sky twice (once on both sides of the backdrop). I drew this plan up quick to see what it would be like. I decided that if I extended the switch back track back along the mainline I could use a second switch back to get on the other side of the backdrop and come into the center of the layout from the end of the run around rather than in the middle of it. I could use some really tall scenery now along the gorge to better mask where the track crosses over to the other side of the backdrop, and actually I could still make that a hole in the back drop and have the backdrop connect to the wall, then just use rocks and trees to hide the opening. on the other side of the backdrop I could use the classic "road bridge over the tracks" trick to hide it, while provide a good way to reach the truck dump tipple I how have where the engine house used to be. I want the longer switch back grade to be steep to look like the grade the MC had at the junction switch. for now I have some preliminary elevations on the plan but I think those are pretty conservative and I think I can go higher with them. on this plan I moved the little engine house down to where I was going to have an off layout coal dock and added a little truck dump tipple where the engine house used to be. I still kept the loading dock spur that I can use for a lot of different things. it may look like I eliminated the hidden staging track, which I sort of did. one option would be to visible stage a lumber train on the switch back and run it as early train. the lumber train could go all the way down to the interchange and tie up for the day (simulating unloading) and then return as the last train. 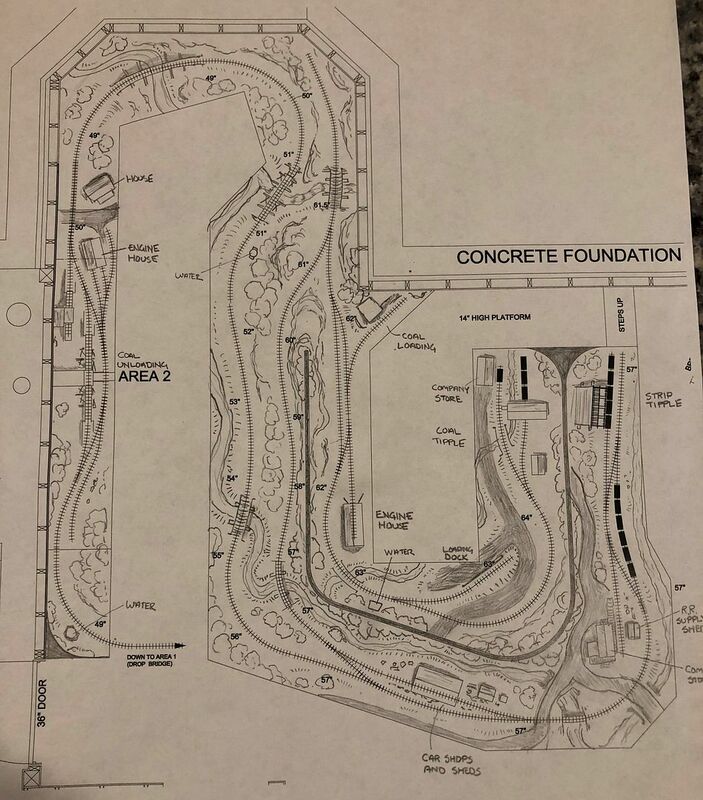 another idea would be to make a space in the back drop around the curved bridge section for a track to be behind the back drop and just extend the switch back tail into a hidden area. I am still thinking about all this. the only other change I made was to use a different company store by the large strip tipple. the Manns Creek store is just so big it almost looks out of place. 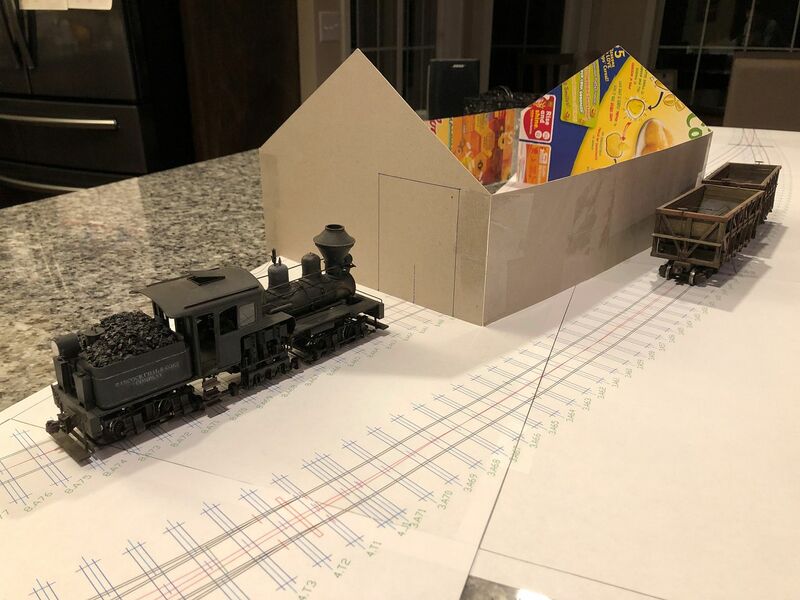 I found a more compressed store plan in an old model railroader and I show it in the track plan with a track alongside it rather than inside it. one think I learned on the last layout is that it is hard to scenic the area between the tracks and the aisle edge. in O scale it is even trickier because you can't put much in the way of structures there because they make too much of a view block. a trick that I am using to keep front edge scenery to a minimum and not be just a boring stretch of ground foam is to use water and roads. adding a stream along the front edge is nice if it can be down because not only does it make a nice low edge that is interesting to look at (and does not require trees), it makes it nice for photos because you don't see the edge of the benchwork. another trick I use is a road, which does not work a nice as a stream but it still makes a nice interesting feature that is minimal in effort. it is still a work in progress. I think I like this plan better. for sure the person on the inside of the layout will get more of a feeling of being somewhere else. I also think the backdrop will give the person on the outside the feeling of separation from the dump trestle. for sure the layout will seem bigger, but the down side will be more cost for photo backdrops. I also started to design the benchwork in Autodesk Inventor. the advantage will be a very accurate drawing and a bill of material with a cut list, which will make construction go very fast. 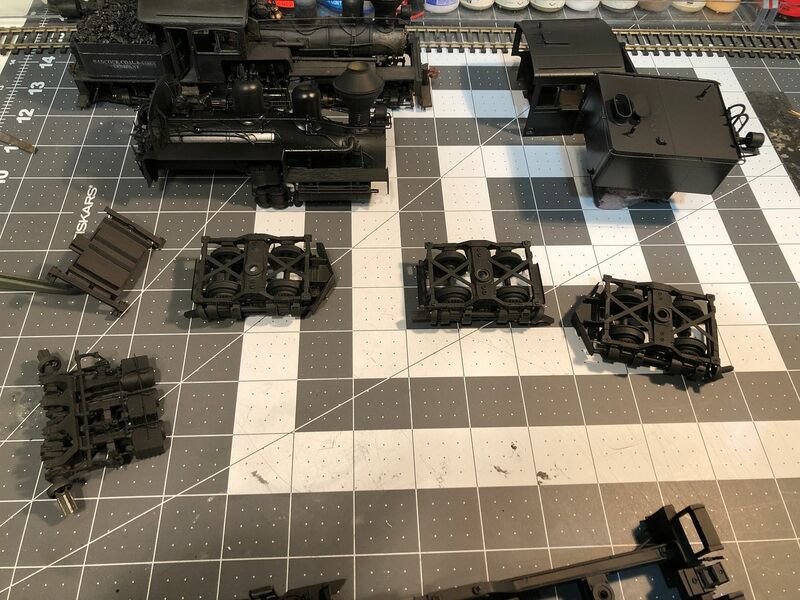 as for actual models of trains, most time this week was getting HO scale stuff sorted for selling, this weekend all the non-R&S stuff is going to a flea market, next week I will start the long process of posting R&S stuff in the selling forum, what does not sell there I will try Ebay. However, I did get the big new shay all taken apart and dipped in thinner to strip off the gloss coat. the temp here right now is -28 outside and it is too cold to use the sand blaster. I hope it warms enough by the weekend to be able to get the shell blasted for painting. So exciting to see a new RR get built! 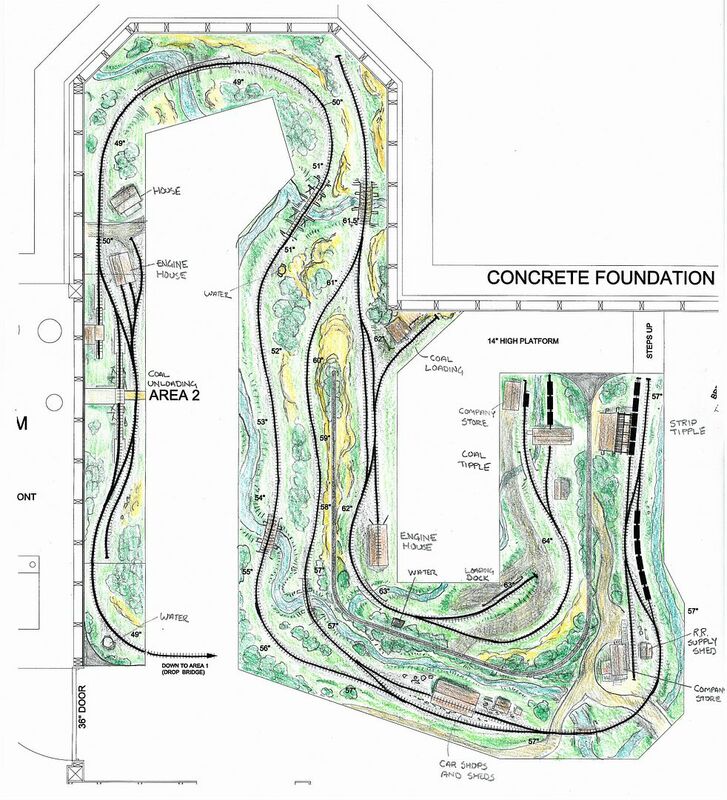 I love the plan - lots of scenery, flowing trackwork, and not too huge. I couldn't figure out where "Area 1". Is that a staging area on the other side of the drop bridge? Here is the lower level. It will be very simple, I don't want a lot of work there to do. All the track will be dual gauge, some of it dummy dual gauge and some functional. There will be a small freight / transfer depot for the narrow gauge. The transfer will be from car to car, no transfer dock. There is a freight dock for shipping and receiving freight from the standard gauge. There is a single storage track for empty consigned cars to be stored. There is no runaround here but there is only one facing spur, which is the passenger depot track. The MC had a single coach that will be stored on the facing spur. The MC did not run a passenger train but I may run one on special occasions. If I run a passenger train the coach will be pushed up to Area 2 and placed on the rear of the train for the rest of the journey. When the passenger train returns the coach will be backed into the station spur. The basic operation at the small yard will be to move cars from the storage track over to the transfer track for loading. Loaded cars will be pulled from the transfer track to be delivered up the line. Most cars when they are unloaded on the narrow gauge are just left empty where they were unloaded, there is no need to return them to a yard, however if another car needs to be unloaded and there is an empty car in the way the empty car can be forwarded down to the storage track. Also, empty coal cars could be forwarded to the storage track if there is (and there will be) a slowdown in car loading. The hill track up to the unloading trestle will be dual gauged and a third rail will be laid out on the dump trestle for the unloading of standard gauge hoppers. The MC unloaded ROM coal for the C&O one car at a time. I'm surprised at the layout height. My N scale and HOn30 layout are both right around 59-61" rail height. In O scale I might want it even higher. Is this where you had the last layout set at? The switchback would give an operator time to walk around and get back into or out of that secluded area. Nice mix of form and function. As for the R&S rolling stock, as a long-time admirer and collector of private road name hoppers, I'd love to have one. Please PM me with details. Interesting Plan. That appears to be quite a clime from "Area 1". The engines should be making good music working up it. I really like the revised plan. You have achieved wonderful separation of scenes with the divider. I agree with Galen that it�s a nice combination of form and function. Ordinarily you don�t want to design a layout where the train disappears through a divider and you have to run around s peninsula to meet it. But the switchback provides a pretext for stopping the train. here is a color version of the plan, it is a little easier to see the planned scenic features. Since there is always a difference from real life to what's on paper I decided to print out some of the areas in full size and see how the will really look. for a lot of modelers they end up not being able to build what they draw because what they drew was too tight, for me I normally have the opposite problem, what I draw is not compressed enough. even though it seems that if we built a scene to full scale with no compression it would be the best thing ever I believe that scenes on model railroads look better with some ration of compression. it is hard to make a scene look detailed and interesting to the eye if everything is all spread out. as I was looking at the plan the first area I am questioning is the car shops area. A photo of the car shop in the Manns Creek book is what really drew me to this railroad and I really want to model that structure in full scale. I also feel from an operation stand point that it is not a waste of switching space. I can have cars assigned to be spotted at the car shop for repair and cars that were repaired can be picked up. also, there may be a case when a load of lumber has to be spotted at the car shop for building or repairing a car. According to photos it looks like about a locomotive length of track should be on the end with the sheds and about 2 1/2 locomotives on the other end. looking at the plan it seems like I have way too much space allotted for this scene, but lets see in full scale. 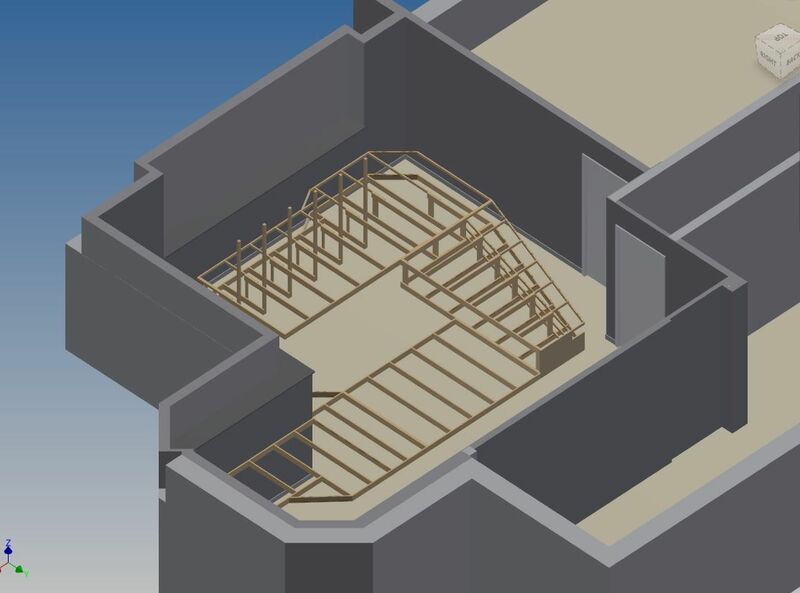 I modeled the plan in Templot, with can be one of the more frustrating programs to figure out, but for people that handlay track it is worth the struggle. after I laid it out in templot I did some quick 11x17 prints and taped them together. when I have a finished plan I plot them on the big plotter all in one sheet, but the printer is quick and dirty (and cheap). I had a structure mock up from my previous layout, so I grabbed it, a couple cars to check clearance, and shay #2. I laid them out on the kitchen counter and this is what it looks like. I believe the end with the shay looks pretty close to what I have seen in the book. there are photos of shay #2 sitting in that spot and the spacing all looks about right. the other end seems to have a little too much space, which I believe is caused by not enough curve in the mainline to cut back across the track coming out of the car shops, which in photos I have looks pretty straight as I passes the sheds. because I have to go out around the backdrop in this spot I don't know if I could get it to change, unless I shift the scene to the right some. overall I like how it turned out. Something is finally happening at the new house, I tore apart the new shay, degreased it, sand blasted it, and it is now in black paint! The color plan looks great, as does the mock-up.